NEW YORK. I know I’ve been neglecting the blog this past week, but I’ve been preparing for something super exciting that I’ve been dying to tell you guys about! Right now my entire life is packed in boxes and on Friday morning I will be on a plane to my new hometown, New York. Am I nervous? Absolutely, but challenging yourself is exactly what makes you grow as a person, and this is an opportunity I wouldn’t dream of missing out on. This weekend me and Mattias will be moving into our new apartment which doesn’t have a single piece of furniture as we speak, but I’m praying that our bed arrives on time so we won’t have to spend our first night in NY on the floor. I hope you guys will understand if the updates on the blog are a bit sporadic during the first few days but I’m so, so excited to take you with me on this adventure! LEAOPARD COAT Zara (similar one here). KNIT Wera. BEANIE American Apparel (similar one here). BAG Proenza Schouler. This entry was posted in Outfit and tagged moving, New York, NY by Carolina Engman. Bookmark the permalink. That’s so exciting – hope it all goes well for you! What an amazing opportunity, to move to such a wonderful city! I am glad for you, can’t wait to see your new outfits of new yorker! Wahh, this is so exciting !!! You’re so luck :) Hope evertything goes well with the moving !! This BETTER not be an April Fool’s joke!!! So exciting. wooooow, thats is soooo exciting. how comes? will you be working from there?? have so much fun and a save flight! How exciting! Love your coat! WOW that’s so awesome!!!!!!!!!!!!!!!!!!! Good luck and congratulations!! Love the coat and the hat is such a cool touch! Exciting! Good luck with the move! Great news! NY is one of my favorite cities! Congratulations! That is so exciting and zour coat is perfect. Have a nice day. BEST of luck! I’m in love with that city! i LOVE YOUR SWEET BAG! how amazing! It’s a wonderful opportunity! SUCH A GOOD OPPOTUNITY! Eveything will be awesome I´m sure! Big kiss from Spain! oh my i am so jealous babe !!!! this will be AWESOME !!! big big big congrats :) looking forward for pictures !!! You’re so lucky, this is great! wow,that sounds so exciting!!! packing your life and moving to New York! every girl’s dream! i wish you a lot of success there\! So fun!! Hope to see your stylish self around the city! Wow that’s super exciting! good luck with the moving out!! So jealous! Can’t wait to see how this new move will affect your blog content. Very exciting! Wow, this is a good news, wishing to you and Mattias all the best, hope this new challenge life is giving you, can you guys appreciate it and can be a really good one. ;) My best best best wishes for you! oh my god, this is I think a dream come true for every girl!Congrats on the big move, so excited for you both! !Have a safe trip and stressfree moving time!! Sounds intriguing!! Hope NY treats you well! So cool! Hope you will enjoy your new life! NYC is such an exciting city!!! Oh my God, this is amazing! I am so excited to read about your life there. New York is such an amazing city. Ahhh GOOD LUCK!!! I love NY so much, can’t wait to visit later this year! wishing all the best for you both, I’m sure that this adventure will be a huge success!! Wow, that’s such a huge step, I hope all goes well! WOW , very exiting news ! I am sure you will enjoy NY a lot ! Amazing!! Much luck in NYC!! Congratulations!!! You are gonna love NYC!!! Congratulations and welcome to the city :) I hope your move goes smoothly — I think you’ll love it here! best wishes for this great change!!!! That’s so exciting! I’m so jealous and excited to see all of your blog posts to come. 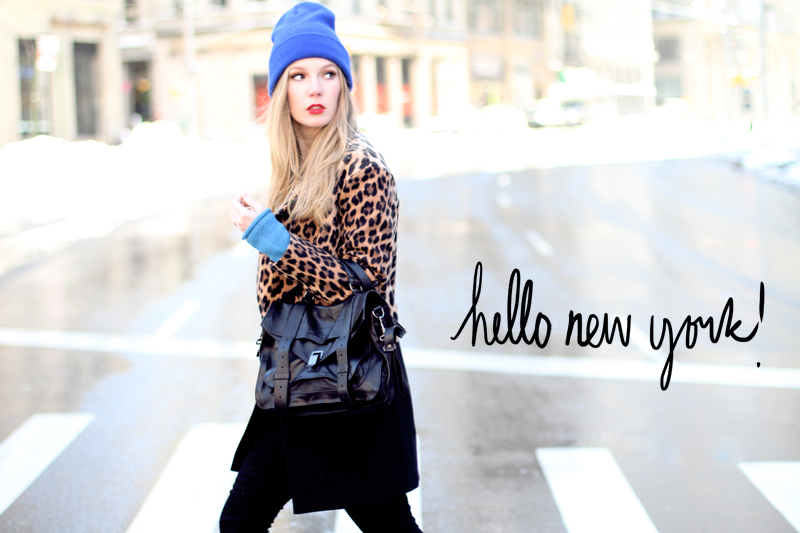 Love that leopard coat! I’ve got it and I have showed it recently on my blog! Don’t miss today my post with some 80’s style outfit proposals. REALLY???? OMG that is so great!! You’re so lucky you know… I’ve been dreaming of moving to NY my whole life and I can’t that happening anytime soon but I know someday it will happy. Wish you both all the luck and hapiness in the world. Keep us up-to-date. That’s awesome! I’ll be moving there too this fall for school. Good luck with the move, I’m sure you’ll love NY! I would LOVE to live in New York! I’ve imagined myself going shopping in high class brand name stores in red heels, red lipstick, and sunglasses with a cute outfit in New York, which is an unrealistic dream but a nice one. Also, you look kind of like Taylor Swift in this picture. Wow, good luck in New York! Congrats on the move! That gorg coat will fit right in your new home. Good luck with the move and welcome to NYC! Wow! Congrats Carolina. I can’t wait to share this journey with you. I’d love to live in NYC so there is a little green monster rearing its ugly head, but I’m so excited for you!!!! You know, i’ve been always dreaming about NY!! Hopefully, very soon im going to realize mine too!! yayiee!!! its a big step Good Luck! Wow how exciting! Hope everything goes smooth! Perfect outfit, Love The coat! Oh my. Sounds so exiting.! have fun in NY. Good luck in NYC!! Love the look! Good luck with your move! Hope the bed arrives in time! Wauw! That’s amazing. So exciting. Hope it all goes well! Waaw that will be so cool!! I am now in NY for the moment and love it !! wow! that is so so exciting! Also, I hope you’ll show us your new appartment in New York! Wow! This must be so exciting! Wow how cool News :) Good Luck in New York!!!! Amazing experience! Let us know about you and NY!!! Wish you and Matthieu a safe flight! Wow!!! It’s my dream to live in New York, you’re such a lucky girl! Have fun and make the most of the best city in the world :D Love from Argentina! Great post , good luck in NY! A dream come true! I hope to move their when I’m done with school. Wow this is too excting! Let me add this to my “I couldnt care less” list!! And there is no point in fallowing a blog where you are supposed to talk about fashion but you only talk about your personal life! so good bye! So exciting! A warm welcome. You will love it here! Looking forward to your new- New York inspired posts! wow congrats babe! i hope your move will not be too stressful! OMG i’m so jealous! Living in NY is a dream! What a cute outfit! – And you’re so lucky to be moving to New York! Wow! that is such exciting news and moving to such an exciting city! I’m sure you will be occupied for the first couple of weeks. I just began reading your blog, I must say I really enjoy it and I’m in a similar situation myself. Just got news I’ll be moving in a couple of months. Good luck with your move and can’t wait to read about your new adventures! new yooork… cityy which never sleeeeeps…. perfect, I´m sooo happy for you! NYC is where you can dream big. Good luck. Love the blue with animal print. That is so exciting!! I am jealous, I want to go New York!!! OMG!! why are u moving?? something new???? the only bad thing is that i bet u will miss your bestie andy right :( good luck on this new city!!! This is a model challenge, right? You’re gonna live in a high rise in Williamsburg or Tribeca, go through the perilous task of getting your tall caramel macchiato on a daily basis from one of the 10 Starbucks on your block, and your exercise will consist of shopping at Bergdorf’s. Only to a model is this a nerve racking challenge FFS! wooow so excited for you!! What an amazing opportunity, i can imagine your happiness. so exciting, welcome to the neighborhood! ahhh i am beyond excited! welcome you two! Good Luck! I cant wait for your future posts! I hope to visit NY this year! I hope one day I can move to the big apple too! Good luck with the next phase of your life! Have a blast in NY, live your life to the fullest in this amazing city! Congratulations!!! It’d be a dream moving to the MOST EXCITING CITY in the world, enjoy It and let us know everything about living there!!! Best of luck, you’ll love the experience. wow so luck! wish i could move to NY! Helloo!! I love this city. Been there! I spent the first couple weeks here on an air mattress with a suitcase in an empty apartment.. but soon you’ll feel right at home!